In the wake of the 2012 presidential election, some political commentators have written political obituaries of the “red” or conservative-leaning states, envisioning a brave new world dominated by fashionably blue bastions in the Northeast or California. But political fortunes are notoriously fickle, while economic trends tend to be more enduring. Overall, these corridors account for 45% of the nation’s land mass and 30% of its population. 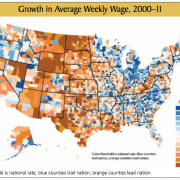 Between 2001 and 2011, job growth in the Great Plains, the Intermountain West and the Third Coast was between 7% and 8%—nearly 10 times the job growth rate for the rest of the country. 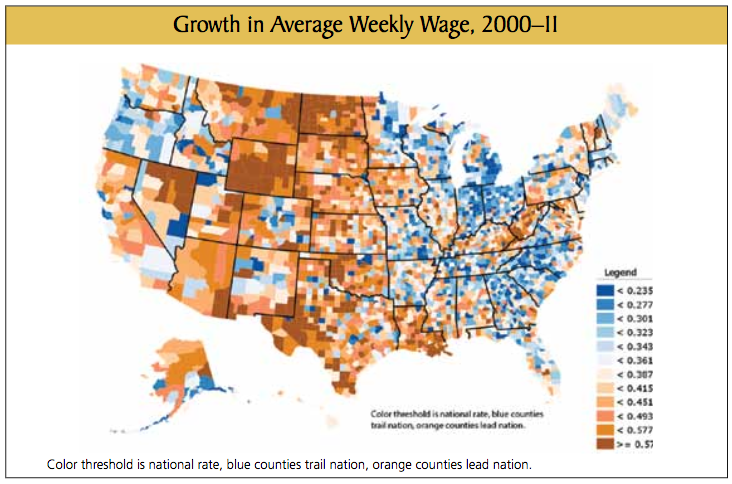 Only the Southeastern industrial belt tracked close to the national average. Historically, these regions were little more than resource colonies or low-wage labor sites for richer, more technically advanced areas. By promoting policies that encourage enterprise and spark economic growth, they’re catching up. Such policies have been pursued not only by Republicans but also by Democrats who don’t share their national party’s notion that business should serve as a cash cow to fund ever more expensive social-welfare, cultural or environmental programs. While California, Illinois, New York, Massachusetts and Minnesota have either enacted or pursued higher income taxes, many corridor states have no income taxes or are planning, like Kansas and Louisiana, to lower or even eliminate them. The result is that corridor states took 11 of the top 15 spots in Chief Executive magazine’s 2012 review of best state business climates. California, New York, Illinois and Massachusetts were at the bottom. The states of the old Confederacy boast 10 of the top 12 places for locating new plants, according to a recent 2012 study by Site Selection magazine. Energy, manufacturing and agriculture are playing a major role in the corridor states’ revival. The resurgence of fossil fuel–based energy, notably shale oil and natural gas, is especially important. Over the past decade, Texas alone has added 180,000 mostly high-paying energy-related jobs, Oklahoma another 40,000, and the Intermountain West well over 30,000. Energy-rich California, despite the nation’s third-highest unemployment rate, has created a mere 20,000 such jobs. In New York, meanwhile, Gov. Andrew Cuomo is still delaying a decision on hydraulic fracturing. Cheap U.S. natural gas has some envisioning the Mississippi River between New Orleans and Baton Rouge as an “American Ruhr.” Much of this growth, notes Eric Smith, associate director of the Tulane Energy Institute, will be financed by German and other European firms that are reeling from electricity costs now three times higher than in places like Louisiana. Korean and Japanese firms are already swarming into South Carolina, Alabama and Tennessee. What the Boston Consulting Group calls a “reallocation of global manufacturing” is shifting production away from expensive East Asia and Europe and toward these lower-cost locales. The arrival of auto, steel and petrochemical plants—and, increasingly, the aerospace industry—reflects a critical shift for the Southeast, which historically depended on lower-wage industries such as textiles and furniture. Since 2000, the Intermountain West’s population has grown by 20%, the Third Coast’s by 14%, the long-depopulating Great Plains by over 14%, and the Southeast by 13%. Population in the rest of the U.S. has grown barely 7%. Last year, the largest net recipients of domestic migrants were Texas and Florida, which between them gained 150,000. The biggest losers? New York, New Jersey, Illinois and California. As a result, the corridors are home to most of America’s fastest-growing big cities, including Charlotte, Raleigh, Atlanta, Houston, Dallas, Salt Lake City, Oklahoma City and Denver. Critically for the economic and political future, the growth corridor seems particularly appealing to young families with children. Cities such as Raleigh, Charlotte, Austin, Dallas and Houston enjoy among the country’s fastest growth rates in the under-15 population. That demographic is on the wane in New York, Los Angeles, Chicago and San Francisco. Immigrants, too, flock to once-unfamiliar places like Nashville, Charlotte and Oklahoma City. Houston and Dallas already have more new immigrants per capita than Boston, Philadelphia, Seattle and Chicago. Coastal-city boosters suggest that what they lose in numbers they make up for in “quality” migration. “The Feet are moving south and west while the Brains are moving toward coastal cities,” Derek Thompson wrote a few years ago in The Atlantic. Yet over the past decade, the number of people with bachelor’s degrees grew by a remarkable 50% in Austin and Charlotte and by over 30% in Tampa, Houston, Dallas and Atlanta—a far greater percentage growth rate than in San Francisco, Los Angeles, Chicago or New York. Raleigh, Austin, Denver and Salt Lake City have all become high-tech hubs. Charlotte is now the country’s second-largest financial center. Houston isn’t only the world’s energy capital but also boasts the world’s largest medical center and, along with Dallas, has become a major corporate and global transportation hub. The corridors’ growing success is a testament to the resiliency and adaptability of the American economy. It also challenges the established coastal states and cities to reconsider their current high-tax, high-regulation climates if they would like to join the growth party.